Jimmy Butler helped the Minnesota Timberwolves improve their win total by a whopping 16 games from the 2016-2017 season to last season. Playing with one of the NBA’s most promising young big men and surrounded by, umm, a familiar cast of playoff-tested veterans, it would seem that Butler has landed in a near ideal spot for the next phase of his career. 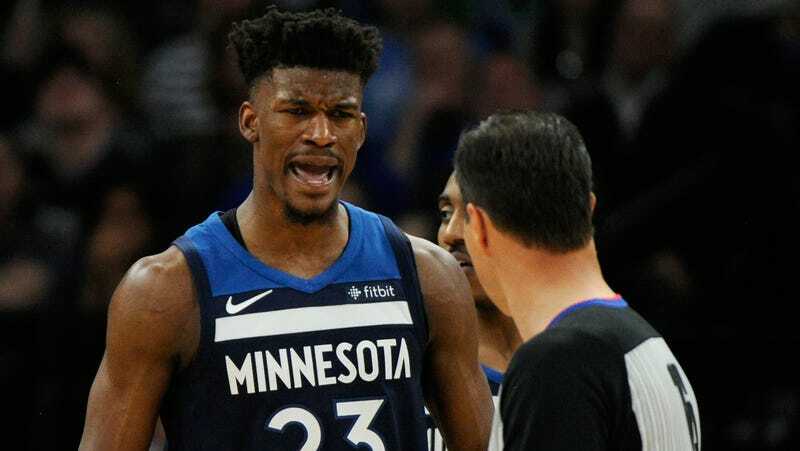 With the opening of training camp 10 days away, it appears the Wolves and Butler have reached a fork in the road, with months of tension and uncertainty involving Butler, Karl-Anthony Towns, Andrew Wiggins and Thibodeau possibly coming to a head, sources told Shams Charania and me. It turns out the meeting was not held Monday—Butler says it’ll happen on Tuesday—but there seems to be an awful lot of smoke, here, enough that NBA-knowers are floating trade possibilities. It appears to be the case that Butler, Karl-Anthony Towns, and Andrew Wiggins don’t much like playing together, which wouldn’t be such a huge deal on its own—LeBron James won a title with Kyrie Irving and Kevin Love despite none of them much enjoying the experience of playing together—but there are pressing contract matters that directly affect both the immediate and longterm future of the organization.